Old pals catchin’ up and helping out in the kitchen after making biscuits for Brain Injury Awareness Day! The “No Limits Fab Four” aka DJ, Brandon, CL, and Andre. Looking great gentlemen! Brandon and CL posing for a “loco” or “crazy” photo in the parking lot before heading into visit with the Delegates and Senators in Richmond for Brain Injury Awareness Day! Here is a “non-loco” picture of CL and Brandon before heading in to meet with the legislators. Look how happy these two men are to promote Brain Injury Awareness! We are sorry to announce that we were so busy this year while visiting the Virginia General Assembly that we forgot to take a picture of our hard work in action! Here we see Brandon posing for a picture with an informational card/treat sample packet that was delivered to the desk of every Delegate and Senator in Virginia! Zel making sure we stay warm by helping with a monthly air filter inspection. Gotta make sure the vents are clean! Thanks Zel and great work. Two great friends – Zel and Adrian. Thank you to our Health & Safety Team for being such a big help! Our newest member of No Limits, Brianna, taught us to make a delicious and healthy “Pozole” or a Mexican Stew this week. Thank you Brianna it was very good and fun to learn from you!! Thank you Zel for helping Maryann to call Bingo! What flavor is it Rachel?! Hehehe, we gave her a sour one with no warning! Sorry! She did guess the flavor correctly though. Maryann, Andre, and David hand-making cat treats that will be delivered to the Delegates and Senators at the Virginia General Assembly when we travel to Richmond next week for Brain Injury Awareness Day. A special shout-out to our buddy Andre who came to help out on his birthday!!! Thanks again Andre, and happy birthday! Look at all these treats! We are excited to offer the cat treat samples along with our informational rack cards to the legislators in Richmond in order to show them an example of the productive work that we do here at No Limits. Last year we took dog biscuits and we think it was a huge success! We made over 4,200 hand-made cat treats to be delivered. WOOP WOOP! Great work team! Bag on my peeps, bag on! Bag those cat treats for the legislators! It is with a heavy heart that we announce the passing of our long-time friend and one of our favorite Star Transit bus drivers, Barry Kranich. 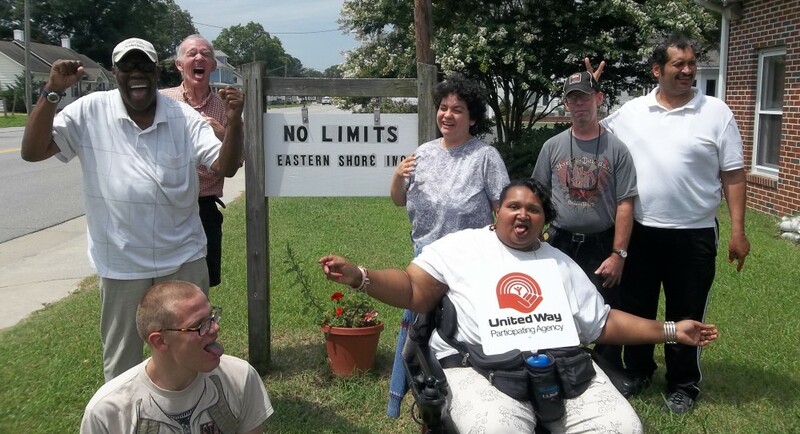 Barry was an avid supporter and dear friend of No Limits Eastern Shore. He will be greatly missed and we hope that he may rest in peace. Zel and Kyle determining how many bags of cat treats we will need when we visit the General Assembly for the 2018 Brain Injury Awareness Day! Work on my men, work on! Happy birthday to Zel and Brianna, our newest member here at No Limits. Welcome Brianna! Zel caught Emma finishing up her day, hooray! (shredding the daily to-do list) Nice photography work Zel! These two men are working on a monthly first aid kit inspection. DJ giving us a thumbs up to let us know everything is okay! Thank you for always keeping us safe. Getting ready for spring and clearing up some space for more indoor gardening! The No Limits Crew strengthening their minds by working on thinking, attention, and memory skills. Nice! The No Limits hens pecking around, chillin’, and enjoying the sun! It is kind of hard to see – but this is a picture of DJ and Zel helping out the chickens by cleaning the coop. The “Hard-working, Chicken Helping, Three Stooges” are getting some sand in order to put the finishing touches on the nice, clean, chicken coop! Dig on! Chef David helping to fill our bellies by making Maryann’s birthday cake. More please! Happy birthday Maryann! And many, many more! Say cheese! We love Maryann’s smile in this picture. It looks like she’s having a nice time. Happy birthday again Maryann!